Cloud computing promises to significantly change the way we use computers and access and store our personal and business information. With these new computing and communications paradigms arise new data security challenges. Existing data protection mechanisms such as encryption have failed in preventing data theft attacks, especially those perpetrated by an insider to the cloud provider. 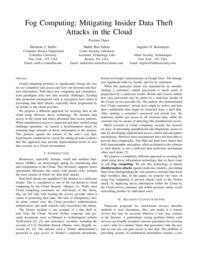 We propose a different approach for securing data in the cloud using offensive decoy technology. We monitor data access in the cloud and detect abnormal data access patterns. When unauthorized access is suspected and then verified using challenge questions, we launch a disinformation attack by returning large amounts of decoy information to the attacker. This protects against the misuse of the user's real data. Experiments conducted in a local file setting provide evidence that this approach may provide unprecedented levels of user data security in a Cloud environment.